Samphire Restaurant at the Waterside Hotel , is located in the seaside village of Donabate , on the North side of Dublin . 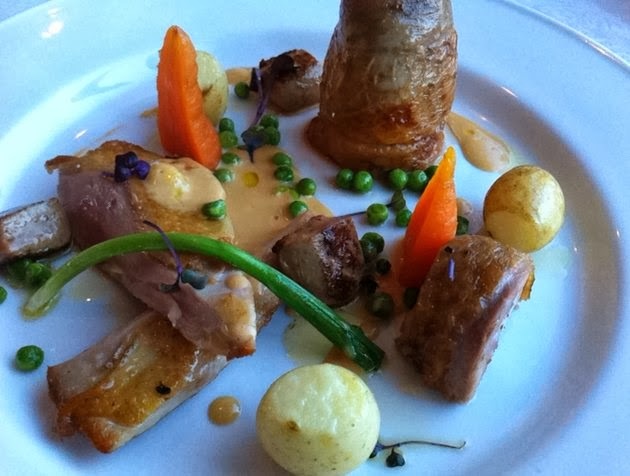 Shortlisted in the Best Hotel Restaurant Category at this Year Irish Restaurant Awards 2013 . Its Success relies without a doubt on its Executive Head Chef Tom Walsh , and not surprisingly, who was also shortlisted in the Best Chef Category . He is one to watch , with plenty of flair and his innovative Culinary additions that ensures each dish shines , not with cheffy attitudes but with perfectly paired flavours . We were greeted warmly by the staff , who proved to be courteous , friendly and polite throughout the evening . We were shown to a window side table , where the views of Dublin bay were spectacular . My only gripe is with the decor of the dining room , which I found to be drab . But I was soon distracted by the Menu on offer . It sang with seasonality and imagination . 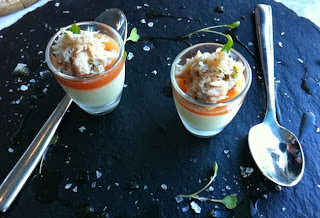 We started our meal with an amuse bouche of Castletownbere Crab , lemon brulée and grapefruit jelly . The light and lemony set cream was well paired with the grapefruit jelly , While one was deliciously creamy and smooth , the other offered a welcoming contrast in texture and with just a hint of citrusy zing which complimented perfectly a spoonful of herbed Crab meat . A beautiful start and enough to get your juices flowing . 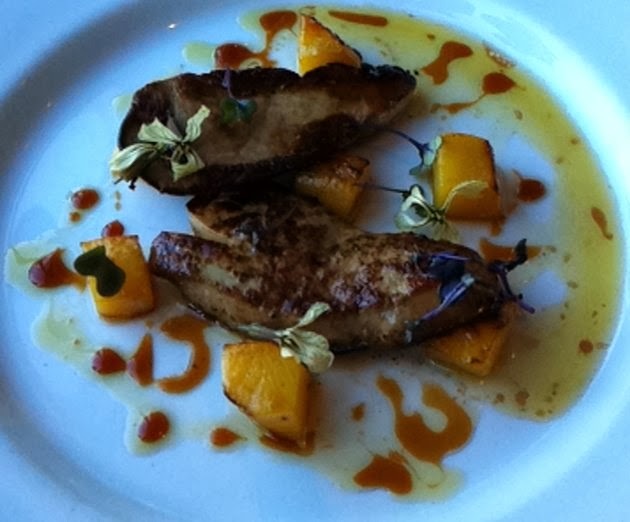 Our starter of Pan seared Moulard Duck foie gras , caramelised Mango , sherry vinegar reduction were two slabs of Foie gras , beautifully seared and seasoned . 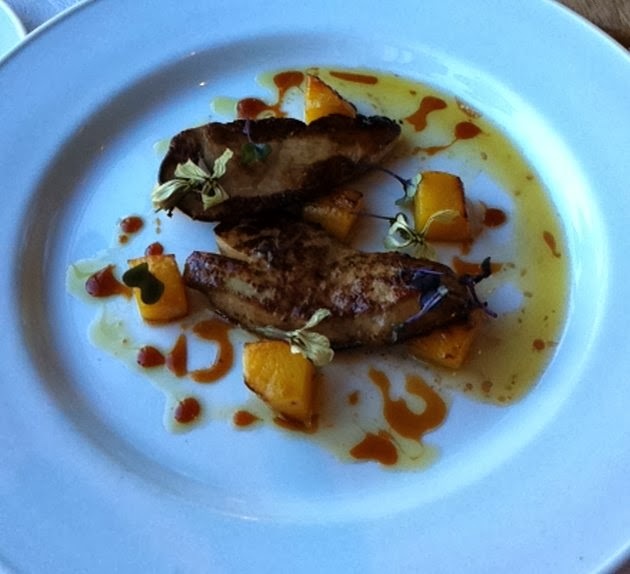 Bright , swollen cubes of caramelised Mango reflected the fragrant and fruity flavours on the plate and muted the buttery smoothness of the foie gras . With a drizzle of Sherry Vinegar reduction and lots of toasted brioche , the result was utterly delightful . Our first main of Roast Guinea fowl , truffled peas , rainbow carrots , new potatoes , foie gras and Albufeira , consisted of a piece of Guinea fowl breast with perfectly crisp skin , sliced and drizzled with a rich and creamy albuferia sauce . A baillotine of its leg offered the darker and more gamey flavour of the meat . The whole ensemble was finished with a scattering of truffled peas , foie gras , rainbow carrots , new potatoes and for a decorative flourish , some sprigs of purple cress . While all this make for a complicated description , the combination of flavours and textures on the plate were faultless . 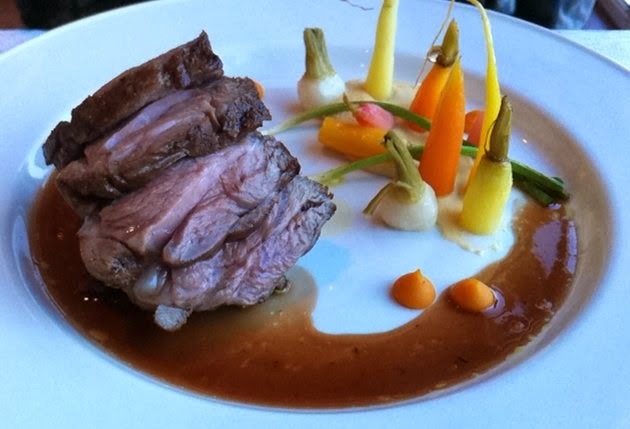 This was followed by Rump of lamb , shallot & rosemary rosti , red currant jus and micro veg . The lamb had a delicate and almost floral flavour . It was beautifully cooked , moist and very tender , along with the ingenious shallot & rosemary rosti and red currant jus , it was a beautiful and rewarding dish. Cylinders of micro vegetables , looking elegant and inviting captured the season on a plate . Utterly stunning. For dessert , we had the Creme brulée , blood orange sorbet , pistachio and raspberries . 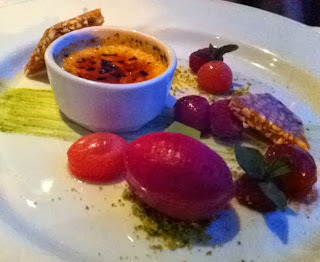 Almost too rich but incredibly sensuous , with a light glassy caramel topping , the brulée was smooth and velvety . The blood orange perfectly matched it's sweetness , pistachio crumbs and nougatine offered contrast in textures as did the raspberries pops which exploded in one's mouth in a gigantic burst of freshness and fruitiness . Utterly divine and I never thought ,I'd say that about a creme brulée!! honeycomb , salted caramel ice cream , apple jelly , apple crisp and butterscotch sauce . 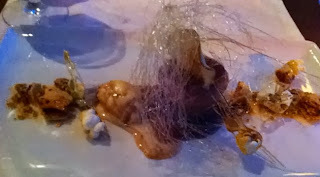 This was a heart stopping , jaw aching confection that was , beautiful to look at , fun to eat as it was tasty . A Chef d'oeuvre . It is hard to believe that Samphire is only celebrating its first anniversary next week . With such glorious food , may I wish them all the very best and I , for certain will be back .